The Canadian Indian residential school system, founded in the 19th century, was created for the sole purpose of forcing the assimilation of the Aboriginal (First Nations) peoples into western, “civilized” Canadian society. Basically, this system of schools, which was jointly-controlled by the churches and the federal government, believed that indigenous children needed to be “civilized” in order to assimilate into modern, western, Canadian society. 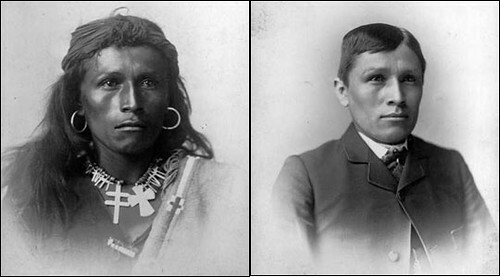 They aimed to achieve this goal by forcibly taking young children (as young as 6 years old) from their homes and placing them in residential schools until they were at least 16 years of age; supposedly, they were to return to their homes during the summers, but many didn’t see their families for years at a time. The children in these schools were forced to learn English, dress like their Canadian counterparts, and convert to Christianity. They were prohibited from speaking their native languages and subjected to corporal punishment if they spoke anything other than English and French or were caught practicing non-Christian faiths; ultimately leading to the cultural genocide of an entire people. Students were also forced into manual labour in order to maintain the already severely underfunded facilities. During the 1950’s there were 76 residential schools in all but three provinces in Canada. By 1969, the federal government had taken sole control of the residential school system, and by the 1990’s it was finally revealed that several students were subjected to severe physical, mental, and sexual abuse by teachers and other school officials. The last residential school in Canada was finally closed down in 1996. Several court cases led to monetary payments to survivors from the federal government, and in 2008 the Canadian government issued a formal apology to the survivors, their families, and the entire First Nations community. But was this apology too little too late? Of course it was! An entire people’s culture, traditions, their very identity was stolen from them, wiped away from their mental history books! That doesn’t even include the hundreds of children who died while enrolled in these schools. When these young children were sent back home after they’d been “civilized” they were like strangers in their own homes. They had been changed into completely different people with no connections to their families, their culture, or their heritage. They had lost all ability to speak their native language, no doubt breaking the communication and traditional knowledge sharing between parents and their children. These residential schools had ultimately broken the very fabric of their society, and purposely so. Furthermore, these schools also had grave psychological effects on the Native youth. At these schools, from a very tender age, children were taught that their native culture and identity was inferior and not worth preserving. They were told they were a dirty, uncivilized, backwards people and that in order to function in society they had to denounce everything they knew to be true about themselves and adopt a new, bright, forward-thinking identity, ie: European/Western way of life. Youth ultimately were taught to resent their culture and heritage and to embrace the European outlook, culture and belief system. Today, Aboriginal people want recognition of what was done to their communities as a result of the residential school system. They have asked for and received official apologies from the Anglican, United, and Catholic churches in Canada, which operated the residential schools. But there is still a long and painful road ahead before the First Nations people receive the reparations and justice they deserve and so badly need. Unfortunately, this information (like much of North America’s dirty past) is not taught in public schools, so it’s completely absent from peoples’ consciousness. Nor is this given anywhere near the amount of necessary media attention it deserves; but then again, what important social and political topics are? But the truth of the matter is that the issue of genocide of the Aboriginal people is not something that happened in the past and is now over; no, these people are still fighting and will continue to fight for their land rights, their sovereignty, and their natural resources which to this day, are still being stolen, polluted, or in one way or another, colonized for Euro-Canadian imperialistic gains. To learn more about this untold story of the genocide of the Aboriginal peoples, please visit Hidden From History: The Canadian Holocaust. Below is the trailer of a full-length award-winning documentary on the planned extermination and genocide of the Aboriginal people by the churches and state in Canada. The film is told through the eyes of survivors of this genocide, and a former minister who tried to hold his church accountable for its crimes. The full-length film can be seen here: Unrepentant. Tomorrow, February 14th in Toronto, we will be marching in the 5th Annual Rally for our Missing Sisters in solidarity with and to commemorate the over 500 Indigenous women who have been murdered or gone missing over the past 30 years. We’re demonstrating against the complicity of the state in the ongoing genocide of Indigenous women and the impunity of state institutions and actors (police, RCMP, coroners’ offices and the courts) that prevents justice for all Indigenous Peoples. Stay tuned for a report and pictures from that event! Finally, the REEL Activism event that took place last night is a monthly event put on by the church. Next month’s REEL Activism will feature yours truly in a Report back from the Gaza Freedom March in Cairo. The event announcement can be seen here: Gaza Freedom March: A REEL Activism Event. I will be creating and showing a short film about the events that took place in Cairo and give a talk about the political implications of the movement. Stay tuned for more info on that as well!